FROM today, thousands of men and women all over the world will be getting hairy for charity. That’s because it’s Movember again. Movember is an annual event involving the growing of mustaches during the month of November. To raise awareness of men’s health issues, such as prostate cancer, testicular cancer, and men’s suicide. It started in 2003 with a group of 30 lads in Melbourne who decided to grow moustaches for a bit of a giggle. The next year 450 men took part and they raised around £25,000 for prostate cancer research. The trend quickly grew into a global phenomenon and is now a major annual event. Now around five million people – dubbed Mo Bros and Mo Sistas – take part in at least 21 countries. 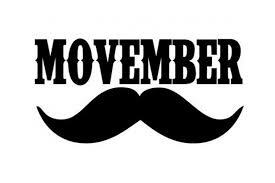 Lastly, by encouraging men (whom the charity refers to as “Mo Bros”) to get involved, Movember aims to increase early cancer detection, diagnosis and effective treatments, and ultimately reduce the number of preventable deaths.